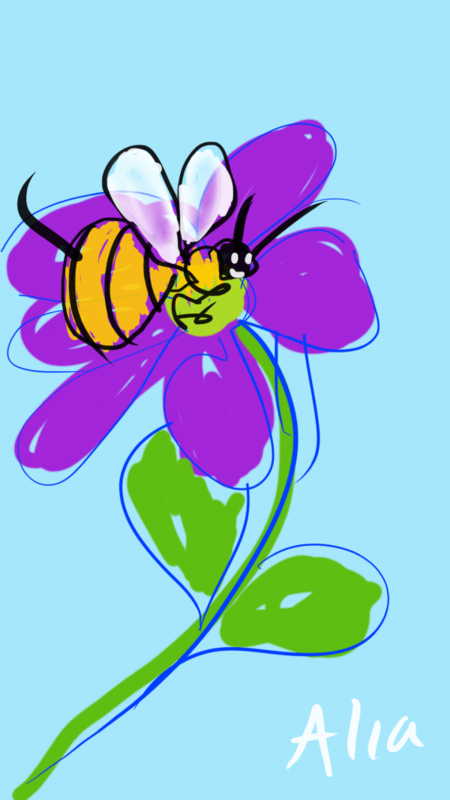 Bees pollinate flowers, right? So so some moths, and a few other insects. The flowers get to reproduce, and the bees get food. Symbiosis is a process in which all parties to the arrangement benefit. Unlike its opposite, parasitism, in which one party benefits at the expense of another, symbiosis is the original win-win. Bees have it easy. They don’t wonder about the ethical ramifications of their floral relationships. They don’t agonize at night about whether it is fair to drink the flowers’ nectar, to fly off with there pollen. They don’t have existential doubts. They have a biological mandate. We, on the other hand, have a bit more of a puzzle to solve. Where is our Biological Mandate? We wonder about a lot of things–we can’t sleep for the constant questions. Is it okay for me to do X fun thing? Do my actions detract from others? Who am I to think my needs are so important? We even wonder if it’s okay to stay home and cuddle our children! And that’s about as organic a mandate as we’re going to get. So all this dance stuff, which is, our culture tells us, selfish frivolity, may demand some soul-searching. And sometimes our discoveries aren’t pretty. For example, when our interests collide with someone else’s. One such conflict of interest is when we give priority to doing things for other people and don’t make any time for ourselves. I don’t know if you have noticed this, but I find that all I have to do is plan something for myself (or even if I have a deadline), and the phone starts ringing, or someone needs help. Women tend to be socialized to help everyone else first. But you know what they say on every airplane? Please secure your own oxygen mask before helping others. It’s great that we care about our friends and family, and it can be hard to carve out a little space for ourselves without feeling guilty. But the fact is, everyone else gets better service when our own creativity is fed and cared for. Another conflict is when a loved one has issues with our dance interests. Some of us step back at that point, often for very good reasons. Some of us go forward, for equally good reasons. For myself, I went forward. Those issues were the last straw in a difficult relationship, and I had already compromised myself nearly out of existence. Another friend stepped back. She found other creative outlets that worked for her. Both of these responses were valid, and both took courage. And sometimes the conflict of interests is with ourselves. Our own doubts and fears can keep us from nurturing ourselves and our creative side. We wonder so hard if we are doing the right thing that we can talk ourselves out of the self-care that dance gives us. We put so much pressure on ourselves. Who are we to dance? We’re not very good. We’re not even “doing anything” with our dance. Well, so what? Just dancing for fun is doing plenty. Fun is important! Feeling good is important to our physical and emotional well-being. If we don’t fill our own well, no one else is going to come along and do it for us, nice as that would be. It’s on us to gather that nectar and pollen. Yes, sometimes it’s very, very hard to give ourselves that love and care, to give ourselves time to rest, to enjoy things, to dance, whatever it is we need to thrive. Nature abhors a vacuum, they say, and our time tends to fill up fast. Many of us have been subject to all three of the above scenarios—most of us probably have done at least two out of three. So what helps? I have to learn this lesson over and over. Other things take a LOT more time than doing a little art. And they are never done. So finishing everything else first is a very bad idea. Do the fun art stuff first and you are set for the day—you get that little cookie of satisfaction that lasts all day long. Put yourself fin a position where you have to do the work. This 90 days is a good choice for that. Marking off the days you dance on a calendar helps to establish a streak. It’s fun to keep the streak going. Having a friend do it with you, so you can check in with each other. I opened up this 90 Days mostly to help myself take care of myself. Just say YES. Humans have made art since they figured out that charcoal marks on rocks. You have the right and the responsibility to make art. Step forward with your unique vision. Give it the nurturing it needs to blossom and grow. No one else in all the world can do what you can. Trust yourself. Let it out. It’s time. Each week we will highlight one part of the routine AND dance through an entire routine (different every time). Each class will be recorded. Each recording will be available for one week. There will also be a Q&A video/phone conference each week. Students will learn structure, moods, and technique, as well as practice improvising through the routine. *Trust the Chef Premium Earlybird Pricing (until Sept 8): $59 (full price $99).